More than 180 people from across the Gulf have been blacklisted for holding fake US academic certificates allegedly bought from non-accredited institutions, including 69 from Saudi Arabia and 68 from the UAE. Almost 10,000 people in total have been blacklisted by the US Department of Justice for purchasing fake high school and college degrees from a “degree mill” based in Washington. According to reports, those named include hundreds of people with links to the US military, educational institutions, government and security agencies such as the CIA. To see the full list of people holding a fake degree, please click here. JEDDAH: A long list of people who had purchased or attempted to purchase fake university diplomas in the United States has spurred the Saudi education authorities to launch an investigation into the issue of Saudis and expatriates who may be working in the Kingdom on counterfeit certificates. However, Shoura Council member Abdullah Al-Tuwairqi called the reaction to the list “disappointing,” and expressed concern that education officials would have a death-by-committee mentality in addressing the issue. The Spokesman-Review newspaper in Washington state recently obtained and posted online a list of nearly 10,000 names of people who had spent $7.3 million on purchasing or attempting to purchase fake diplomas from an illegal operation. The US Department of Justice shut down the illegal enterprise and compiled a list of its clients. The list was then leaked to the newspaper, which posted it online at: http://www.spokesmanreview.com/data/diploma-mill/. The list contains at least 70 Saudis, or persons who listed their country of residence as Saudi Arabia. For example, one of the names on the list is a Saudi woman who bought degrees in obstetrics and gynecology. The newspaper reported that US federal investigators do not know if the woman is currently working as a medical doctor in the Kingdom. […] According to Al-Watan, there are roughly 18 branches of unauthorized universities, with over 5,000 students in the Kingdom. Last year, 70 staff members at different girls’ colleges around the Kingdom were fired for having fake diplomas. […] Unscrupulous sale of fake degrees is a thriving business in the Saudi market. The Saudi Gazette carried out a sting operation to expose one such fake degree dealer in Riyadh. This reporter first contacted the dealer through his email address which appeared in an Internet advertisement. “If you have long experience, but no qualification or you are a masters degree holder and want to have a Ph.D degree but cannot spare the time, you can get the desired degree from London University without study or examination within one month. For more details contact: tariqfarooq112@hotmail.com,” read the personal ad posted by the dealer, apparently aimed at gaining the attention of all those wanting to earn an easy degree. To obtain a Bachelors, Masters and Ph.D degree in a month not only sounds strange, but it is also discouraging to those who earn their academic achievements through diligence and hard work at real universities, and end up competing with fake degree holders for a job. “I am interested in buying a PhD degree in Women’s Studies,” said this reporter to the bogus degree dealer who gave his mobile number. He claimed to be working as a HCW speaker in an environmental protection company which specializes in waste treatment technology for industrial and municipal waste. He gave his office telephone number and extension to Saudi Gazette. However, the dealer could never be contacted on his office number, and would receive calls only when contacted on his mobile number. He spoke Urdu with a Punjabi accent. Saudi Gazette recorded his voice as well. Proudly claiming ‘you name it and we provide it’, the dealer provided Saudi Gazette with a list of degrees ranging from programs in Science to Arts – BA, BSc, MA, MSc, Ph.D, Associate and Professor degrees. “The buyer does not need to attend classes or appear for examinations,” stressed the dealer trying to lure this reporter into buying a fake degree. The candidate’s name, desired date of obtaining the degree and the name of the desired subject were all the prerequisites for procuring a fake degree, apart from a modest fee. The only thing that was not required was to study and appear for examinations. DUBAI — According to a student adviser, the degree I was going to buy online was 100 per cent valid in the UAE. Just pay $515, he said, and I could have a Masters’ qualification in Social Science without the hassle of years of study. But if I had indeed used the qualification in applying for a job, I could have faced a lifetime ban on employment in the UAE or a conviction of fraud. However, the problem persists. In October last year 68 Emiratis were blacklisted from the US for buying qualifications from online ‘degree mills’. Authorities in the UAE at the time said that those caught using fake degrees could be punished with up to 24 years in prison. Several alleged degree mills claim to have printing facilities in Dubai from where they send fake qualifications around the world. The Masters’ qualification above was being offered by Ashwood University in Texas, which claims to have a printing facility in Dubai Internet City. According to James Fitzberg, Assistant Dean of Students, the printing facility was not listed under the name of Ashwood University. He would not disclose the name of the subsidiary. Sandra Davie, a Singapore-based journalist bought a doctorate degree from the University for her dog. She said the parcel she received was sent from Dubai via DHL courier. “I suspect that although the university is registered as a company in the US, the operations were in the Middle East because of the accent of the so-called student adviser who called to chase up for payment,” she said. 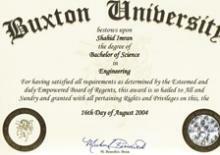 Another company, which also claims to print degrees in Dubai, is Belford University. In an online chat, student adviser ‘Ken Rogers’ said that it was cheaper to print degrees here. However he declined to say whether or not the printing facility was also based in Internet City. A spokesman for the freezone authorities said he had no records relating to Ashwood University or Belford University. Several US States publish a list of unaccredited universities. Degrees gained from the listed universities are illegal to be used in those states.